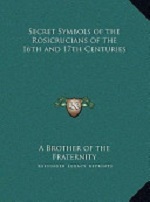 This was the third attempt to get me a book with the secret symbols of the Rosicrucians and this time I got it right! Of course Kessinger Legacy Reprints had the title. The A4 size book is about 60 pages thick and contains the secret symbols “with several figures of similar content added by P.S.” There are of course the wonderfull, famous and elaborate images, but also a couple of very long texts in a tiny font-size. Everything is translated to English and I suppose the translation, because the printer had obvious diffulties with placing the texts everywhere and quite often the texts had to be written by hand in order to get them in the right spot. I still hope to find a printing with better quality, but almost everything is readable, sometimes with some effort though. The images are so weird that you can keep pondering about them, especially because the R.C. used quite a lot of abreviations, some obvious, some totally unclear to me. A nice reprint if you are looking for the same thing.